Each of the 16th century Bolognese fencing masters describe the guards they use in their art. Four of the texts have sufficiently similar sets of guards to say they belong to a common tradition. These are Antonio Manciolino’s Opera Nova (1531, likely originally from 1520’s), Achille Marozzo’s Opera Nova (1536), the so-called Anonimo Bolognese (three manuscripts from roughly the same era) and Giovanni dall’Agocchie’s Dell Arte di Scrimia (1572). Of these the Anonimo, Marozzo and dall’Agocchie define a guard called guardia d’entrare, the “guard of entering”, that has eluded the modern practitioner ever since the start of the HEMA movement. I have a clear idea of this position and I will discuss my conclusions here in detail. Guards are postures that happen during fencing, and the majority of European historical fencing sources use them as a convention for describing and teaching their systems. The Bolognese masters did not explicitly define the meaning of a guard in general, but they give us plenty of information on how the guards were used to describe the motions and tactics of fencing. …standing in rest, and placed in any form with the weapon, to offend or to defend, that placement, position and composition of the body in that way and shape, [is called] a guard. Where it is necessary that as always between two motions we wish to say one has a guard, and between two rests one has a motion. Having considered how important it is to know the names of these guards, I have in this book clearly laid them out in writing and in pictures, for the pleasure I have brought to the warriors and knights that delight in understanding the art of arms completely. And because it seems to me that many who teach others err greatly in not making them understand the way of stepping and examining them in all the guards one by one, name by name and step by step. For while a man could think about dealing a blow without any intention of defending himself, it is necessarily advantageous that between one and the other he should move the weapon before anything else into whatever position it will be found in. And then the legs, from whatever posture they stood while supporting the person. And thus I will begin by following the same kind of natural progression, by manifesting all these postures of hands and feet that are universally and by all called guards according to their effect, and by this I mean those into which a man can order his limbs, and from which first his weapon arm and then the feet can safely move. Antonio Manciolino is the only one of the four main sources under inspection not describing or mentioning guardia d’entrare. It is possible that Manciolino may have used another position, guardia di faccia, to stand in for entrare. Otherwise the position’s importance is lessened by him not using it. For the scope of this study however, I have simply omitted Manciolino entirely. All the other texts describe the guard, and Marozzo gives us a total of three illustrations of it: one with the single sword and two with the two-handed sword. Giovanni Dall’Agocchie describes a fundamentally different guard with the same name, to which the closest equivalent in the other sources would be a guard called coda lunga e alta. I have personally decided to follow the earlier sources, and generally specify “dall’Agocchie’s guardia d’entrare” in case I wish refer to his version. Someone focusing solely on dall’Agocchie would of course choose differently. [While enumerating the high guards] The fourth will be called the guard of entering. It is done as contrary to the aforesaid, that is, holding the arm and the sword extended towards the opponent’s face, but the palm of the hand will be looking down and the true edge of the sword has to look to the outside, that is towards the right side and the body needs to stay with the right side somewhat turned towards the opponent. And it is called thus because it is a most strong guard for entering. The “aforesaid” that he refers to is guardia di faccia, which is done with the palm up and sword extended in front of the face, done similarly by all masters. Being in the said guard you will have to be the patient, because if I remember correctly I have shown you that from this guard few attacks are born, [the student] wanting to be the agent rather than the patient, hence I urge you to wait for the opponent to attack and, having parried, you can more conveniently make the strikes that you wish according to how you find your opponent after having parried. And note that from the said guard you will make the said student go with cutting a roverso and throwing the right leg in front of the left, drawing in this step his right arm somewhat backwards extending his fist towards the ground and then you will say to him that his sword has descended into coda lunga e larga. If you wished to protect yourself in the guardia di entrare it is good to extend the arms towards the opponent so that the point of your sword threatens his face. And the hands, while coupled upwards, must not be placed too far ahead of your head. And for the feet to allow such a strong defense, then it is necessary that the right is placed lightly ahead of the left with the knee somewhat bent. Neither Marozzo nor the Anonimo explicitly state that the guard should be on the left side, as I suggested above, but this will become evident as we look at the illustrations in Marozzo and study the plays where the position appears. The most relevant illustration is the woodcut carving in the original 1536 printing of Opera Nova, which unfortunately leaves some questions about the precise hand position, calling for the study of contextual evidence in the plays for further clarification. The extended arm is very evident, as well as the general position being somewhat aligned towards the left side, with the left leg leading and the heel of the rear foot raised. The grip holing the sword is however done so that the fingers and the crossguard of the sword overlap. Depending on the angle the hand can look more or less like this in multiple positions. Firstly, since the image is drawn from the side, it is difficult to establish the lateral position of the hand in relation to the body. None of the definitions of this position discuss this other than dall’Agocchie, who has the hand on the right side of the body. However, both Marozzo and the Anonimo use the position to parry a mandritto, a cut targeted to the left side of the receiver’s body, which suggests that the position would be on the left side to better close the line. And while the Anonimo executes a similar parry (albeit from different starting guard in these examples), he also uses it to parry a roverso. The Anonimo makes it clear that the position is good for parrying any strike to the upper openings, as well as a thrust and even entering into a stretta di mezza spada, a crossing of swords in the middle of the blades. None of this helps to clarify the position as anything precise that would always be identical. But there is strong evidence pointing towards the guard being on the left side, but first let’s look a bit closer to the hand position shown in the illustrations of Marozzo. I have seen it suggested that the position was in fact such that the left flat of the sword would be held up and to the left, so that the hand was extended from the wrist instead of relying on inwards rotation of the upper and forearm to bring the sword’s true edge up on the left side with the point towards the opponent’s face. And indeed the illustration, with the pommel hidden behind the wrist, can give such an impression. Even more so in the later copperplate engravings by Giambtattista Fontana. However, these new illustrations were created after Marozzo’s passing in 1553, so their accuracy can be disputed. 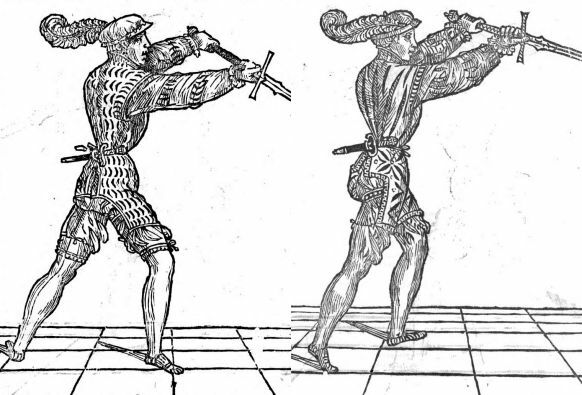 If we look at the guard position with the same name from the chapters discussing the two-handed sword, we get a much clearer picture of the hand positions, clearly with the right arm rotated inwards and the wrist neutral, if not slightly flexed. The fingers are visible as is the grip behind the hand. But since Marozzo does illustrate the position separately for the single-handed sword, we can not justify taking the easy exit and relying on the illustrations in another section of the book. We have to assume that the position with the same name can be different when applied to different weapons. This is also the case with guardia di testa, interestingly different with the single-handed and two-handed sword. A full turn will be, when finding yourself placed in guardia di lioncorno with the fist of the sword high and, making the point of the sword decline towards the face of the opponent, standing with the right foot forwards, if you turn the fist of the sword, so that you will go into guardia d’entrare turning well the sword-hand, this will be a full turn of the hand. But because I wish you to understand better I say that if your opponent is placed in porta larga di ferro with the right foot forwards, and you hold your self opposite him in guardia d’entrare with the right foot forward, making the point of your sword watch directly towards his sword hand, and standing in this position, if you turn only the wrist of the hand keeping the point of the sword directly towards his sword-hand, and arrive into guardia di lioncorno with the hand high and the point declining directly towards his offending hand, this will be a full turn. This, combined with Anonimo’s description of guardia d’entrare and coupled with the description of the mezza volta di mano, half-turn of the hand which is a simple turn between coda lunga stretta and porta di ferro stretta gives us a fairly clear indication of what the position should be like. From guardia di lioncorno (guardia alicorno or becca cesa in dall’Agocchie and Marozzo respectively), a well-documented position where the hand is high on the right side with the point declining forwards, one is to turn the hand in order to reach guardia d’entrare. This strongly leads me to believe the hand has to be on the left side, as this naturally happens and otherwise having the point slope towards the opponent’s hand would be quite awkward. Probably the position of the hand is a little lower than in lioncorno, but still rather high as entrare is listed as a high guard and the hand(s) are told to be kept elevated. But this description could still apply to the variation where the left flat was upwards and the true edge pointed to the left, so let us look into the application of the guard for further evidence. Dall’Agocchie’s use of his version of the guard is very straightforward. He uses it to counterattack with a thrust against a roverso, a cut aimed at your right side. With that covered, and having seen how dall’Agocchie is the outlier with his take on the guard, we will move on to Marozzo and the Anonimo. Marozzo uses the position most often in his material for the two-handed sword, but also occasionally for the sword and buckler, sword alone and even with the dagger. In his section on the sword alone (which only represents a rather small part of the book), he uses the position only once. 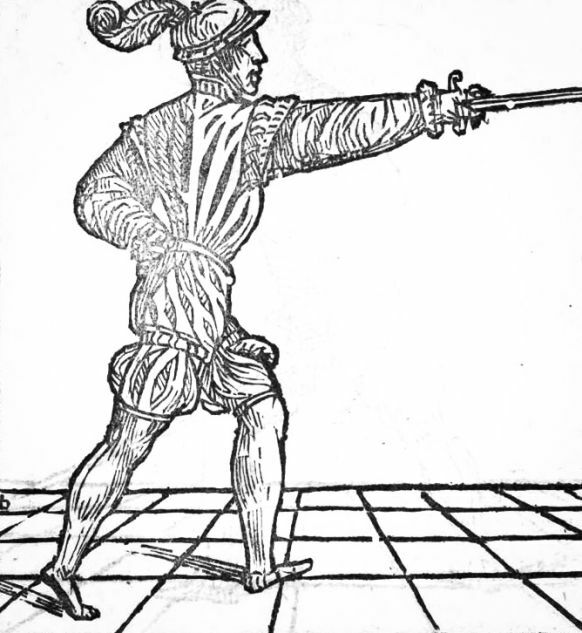 Summarizing the use of the guard in Marozzo, with the single handed sword (and the dagger), he uses it to parry a strike to the higher openings, typically the head, and then deliver a roverso. In fact there are only four instances in the entire book where the position is used outside the chapters on the two-handed sword, and in each of these he does a parry and then strikes with a roverso. This is seen in the Anonimo as well, though there are more diverse ways and more use of the guard. Unfortunately I don’t have a digital transcription of the Anonimo, and for this study I have not been able to go through every instance of guardia d’entrare in the manuscripts. I am basing the conclusions on what is a partial set of actions, and a more detailed analysis will have to be done on a later time in order to say anything with absolute certainty. Passing with the left foot to the opponent’s right side during the action, and following around with the right foot. If the cut was not done on the outside, this footwork doesn’t seem to make sense or follow the generic order of stepping in the tradition. Occasionally executing a grip on the opponent’s sword-arm from the outside and pushing it to the opponent’s left side while delivering the strike. While this could be done with the cut being delivered on the inside, it does not seem likely. Occasionally the roverso is delivered to the leg. Without completely passing to the outside, behind the opponent’s sword, this action seems unnecessarily risky. 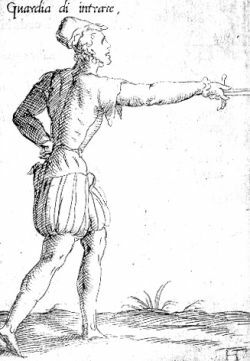 The action of cutting around the opponent’s sword from contact is documented, for example in some of the various plays of crossed swords, the strette di mezza spada. And for whatever it is worth, I would choose this option as more likely based on my practical experience. Hopefully future research can answer this question in detail or at least give more insights to it. Other ways in which the guard is used include entering into it with a thrust following a parry of mandritto, likely using it as an end position after a thrust done on the left side with the palm upwards or with the true edge upwards. Sometimes the position is used to cross swords with the opponent, and I am currently unsure how this will work precisely. My belief is that in this instance the guard is held a little lower and with the blade more horizontal than sloping downwards. When parrying a roverso the point is likely directed somewhat towards to the right side in order to catch the incoming strike. If your opponent has the right foot in front with the sword in guardia alta against you, and you are in porta stretta di ferro with the same foot forwards. Here you will put the point of your sword directly towards his sword-hand, keeping the arm somewhat extended forwards. And so here in this position you will make a feint of pushing a thrust into the said hand, but with speed drop a great fendente over the opposite foot, subsequently throwing a mandritto from below upwards into his sword-hand, that will not pass guardia d’entrare. And without any delay you will pass with the left foot towards his right side turning a roverso ridoppio from below upwards into the sword arm, that will finish in guardia di lioncorno. And then you will pass with the right foot forwards throwing an overhand imbroccata into the chest or the sword-arm that will fall into porta stretta di ferro. The first is the underhand stoccata trivillata, the second is done overhand, descending with the force of a thunderbolt and called an overhand imbroccata. The third is another overhand imbroccata like the previous, but reversed. …you will immediately strike the said foot with a fendente and follow with a mandritto from below upwards to his sword-hand and his sword, that will not go past guardia d’entrare, and then in the instant you will pass somewhat forwards throwing an imbroccata roversa into the face, accomppanied by a roverso fendente, both strikes done simultaneously the sword falling into coda lunga larga. Both the Anonimo and Marozzo offer some other details on how to enter into and use the guard with the two-handed sword, but I will leave them out from this article to keep the focus on the single-handed sword. And while I personally don’t find the idea of the flat turned upwards to be likely, if there is a situation that warrants it, I would still call it with the same name. It seems to be the function, the lateral side, the height and the general orientation of the point that define the guard. There is room for variation, just as we see with guardia di faccia, where the hand position sometimes orients the blade horizontally and sometimes vertically. All in all, the following image I took a couple of years back still fairly well represents what I believe the guard to be in its default form, despite the variations. So why is the guard called guard of entering? With the two-handed sword Marozzo repeatedly tells us to tirare ed entrare, to “draw and enter”, finishing in the said guard. But this is probably referring to executing whatever action it is that you are doing, and then entering into the said guard. Or perhaps drawing the sword back somewhat after the action, then settling back into this guard. It is difficult to say for certain. With the two-handed sword Marozzo gives two forms of the guard: guardia d’entrare in largo passo and guardia d’entrare non in largo passo, guard of entering in wide step and guard of entering not in wide step. The former has the left foot in front, likely somewhat diagonally towards the left side in a long step. The latter has the right foot in front. I have generally not chosen to use these names with the spada sola, but I would not say it would be wrong to do so. Dall’Agocchie gives his reasoning for the name when he describes the guard: “And it is called thus because it is a most strong guard for entering”. For him this means that it is a strong guard for entering against an attack towards the right upper openings, and this position later in the 17th century became an important part of fencing as the downwards thrust from the right side, the imbroccata gradually shifted its meaning to any thrust done with opposition on the outside line, be it descending or direct, executed in what Camillo Agrippa would call seconda guardia. One has to wonder how this position, with coda lunga alta being its closest alternative, seems to receive so much less attention in the earlier sources. This change may well be reflected in dall’Agocchie’s decision to take the name of a guard superficially close to guardia di faccia and dedicate it to a position otherwise without name, thus making his system of guards arguably more symmetrical and a closer match to the emerging new styles of more thrust-oriented fencing. While doing so, how much did he leave out of the earlier tradition? Did he misunderstand some of it or was his choice deliberate? I am confident in my understanding of the parameters inside which a position can be called guardia d’entrare. While studying the Bolognese tradition we must understand how we are balancing between giving ourselves too much leeway and looking for too specific definitions where none were intended to exist. While some details of these guards will keep eluding us, I hope this article has made it easier for you to come to your own conclusions. And if you are currently researching HEMA, perhaps the process outlined here can help you understand other similar questions regardless of the style you study. If you have any questions or comments, please share them below.